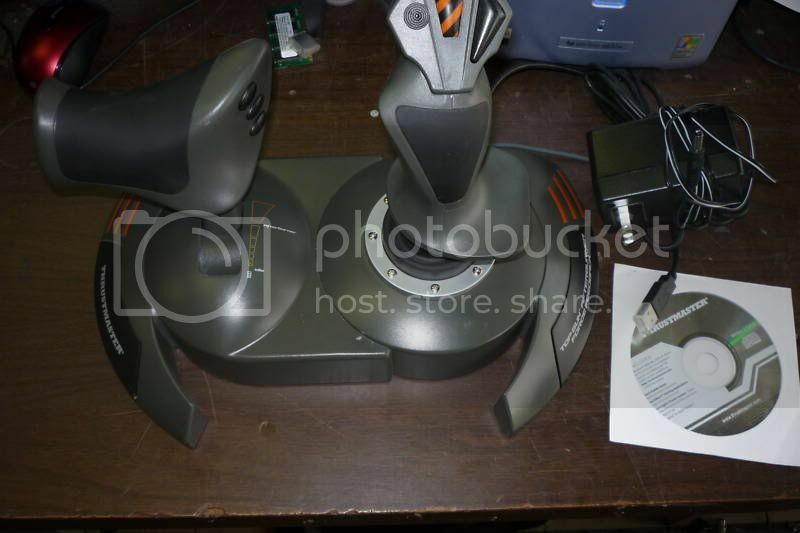 I've also won a pair of Thrustmaster Top Gun Afterburner Force Feedback. Not for collection, but for immediate use. For a long while now it's been bugging me that I didn't own a single decent VLB graphics card so I went to look on Ebay and saw a 2MB Trio64 for sale. In the end I won the bid and now, after a week or so, I received the package. It was very sturdy packed and inside was the card wrapped in a very large antistatic bag. "Strange he wrapped the bag around the card" I thought but nevermind, lets inspect the card. It looked fine except that one of those tarantulum capacitor thingies had 1 of it's legs disconnected and it looked damaged. "Shouldn't be too much of a problem, probably fixable" I was thinking to myself and decided to put the card into the very big antistatic bag. "Huh? Why's the bag still heavy??" there was something else in it? I could see a PCB and took it out. "WTF theres another Trio64 VLB in it!!!" The guy send me 2 cards instead of one!! Not really Retro stuff, but the purchase is related to my current Retro PC project! Unfortunately, KAN still experiences problems with it (ignore the first post), so the stick so far only works as normal spring joystick. Could anyone please help? Rounding out my collection of Virge cards for only $1.25 is the STB Nitro 3D, the GX is the last of the Virge PCI series. bushwack wrote: Rounding out my collection of Virge cards for only $1.25 is the STB Nitro 3D, the GX is the last of the Virge PCI series. I also recommend these. The Virge GX has much better VGA signal quality and slightly better VESA2 compatibility than the earlier models. Kreshna Aryaguna Nurzaman wrote: Unfortunately, KAN still experiences problems with it so the stick so far only works as normal spring joystick. Could anyone please help? You said you got 2 sticks do they both have no ff ? do the power adapters work ? did you install the drivers first then plug in the stick when it told you to ? Davros wrote: do the power adapters work ? Yes. Actually, the Force Feedback effect is there, but it only works as Spring effect, ie, no dynamic Force Feedback. Mau1wurf1977 wrote: Got some more bits! Regarding the CF card - what speed is it? My current 2 and 4 GB CF cards are 133x speed, but I would be interested in testing faster cards, to see if win98 performs any better. Well I didn't have any luck booting from that CF. How fast a CF is? If it's faster than hard drive, then I think it would be a good place to store your Windows pagefile. Kreshna Aryaguna Nurzaman wrote: 2 sticks? Kreshna Aryaguna Nurzaman wrote: I've also won a pair of Thrustmaster Top Gun Afterburner Force Feedback. Er, what I mean by 'pair' is actually a pair of joystick and throttle. I'm still at loss why dynamic force feedback effect does not work, while spring effect (artificial spring created by Force Feedback) works. It doesn't sound like hardware problem, does it? did you try what i suggested ? Davros wrote: did you try what i suggested ? Not yet, I've been pretty busy lately. But I'll let you know the result.